Surf’s up! Celebrate summer with a free LEGO mini build at your local LEGO Store this Tuesday. 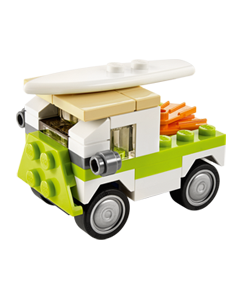 Stop by the LEGO Store at 5 p.m. on Tuesday, July 1, 2014 to build a cool LEGO beach van. It even has a surf board! If you don’t have a LEGO store near you, or you can’t make the monthly mini-build, you can download the month’s LEGO mini-build instructions and build the model using LEGO bricks you have at home. (The plans are usually available after the event has been held). You can also download past monthly LEGO mini build kit instructions for free.